Already getting asked a lot what we are doing and to be honest as yet nothing is confirmed. I’m thinking of doing something different to in-stores this year as there isn’t much left to do there. I have an idea or two for something I hope people will be just as happy with. Getting lots of offers but most are just attempts at self promotion. 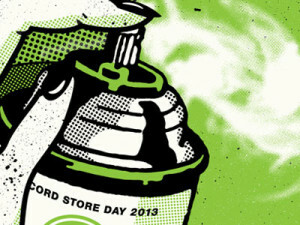 Record Store Day is about supporting high street record shops and not about releasing something or holding an event ON Record Store Day to cash in on the surrounding publicity. I’m organising the national poster campaign so I’m not sure what people are meant to know about the releases as I’ve obviously seen lists already but there’s certainly some good stuff along with things I’m amazed to see. While there is a lot of vinyl that is not meant to be the focus and certainly the irony of HMV jumping on the vinyl bandwagon after the RSD coverage last year was not lost on shops. I did point out that many or maybe even most of the RSD shops don’t support new music on a weekly basis and was told that if the criteria was too stringent there would be very few shops indeed. Maybe however that should be the message we are trying to get across.